For most fashion photographers, Instagram is a meaningful way to showcase their work. Even if you don’t use it as the photographer, the chances are that the brands and people you photograph for will put those photographs online. It makes more sense for you to have your account and hold your narrative over these images instead of letting them just float around on the internet. Hence, if you aren’t already using Instagram as a part of your portfolio and a way to increase your business activities as a photographer, begin now. It is a great way to keep people updated about the work that you are doing, get more followers, views and collaborative opportunities, and to impress potential clients even before you begin interacting with them. Below, we give you a few rules to keep in mind while using Instagram to further your fashion photography career. Even if you are finding yourself continually itching to post new content, DON’T. Posting less often but with really good quality will give you much better returns than giving in and simply posting very often. Even if you don’t see it yourself, your viewers will interact with and like your content more simply if it appeals to them and is visually great, not if you post regularly and end up churning out mediocre content. You don’t want people to forget your work and your existence, but keeping the momentum going with low-quality shots is never a good idea. Work more on good photographs, and post the best of the best, and nothing less. You do not have to keep updating your account if you do not have high-quality content to put there. Focus your time and efforts on more shooting and more experimenting. Make sure that your posts generate conversations or engagement from the audience. This could be through the photographs themselves, or the captions and stories you add with them. Moreover, engaging with other accounts by checking out their work, leaving a comment or likes, and telling them how much you appreciate their work. All artists enjoy feedback just as much as you do, and by engaging with them, you increase the chances of them checking out your content. However, remember not to spam accounts asking them to check out your work or announcing your presence. Also try to follow the 1-2-3 rule which some Instagrammers use, which means that your comment on two other posts, and like 3, for every 1 picture that you post. This is an excellent habit to get you started on interacting with other users. Make sure that you include the links to your portfolios, other social media, or your business pages on your Instagram in the bio or your captions so that potential customers know where to go. Moreover, keep your contact details including your email and phone number easily accessible so that they can contact you directly if they wish to. Also, make sure that you get other accounts that are posting your photographs to do the same and to credit you for any photographs of yours that they choose to post. 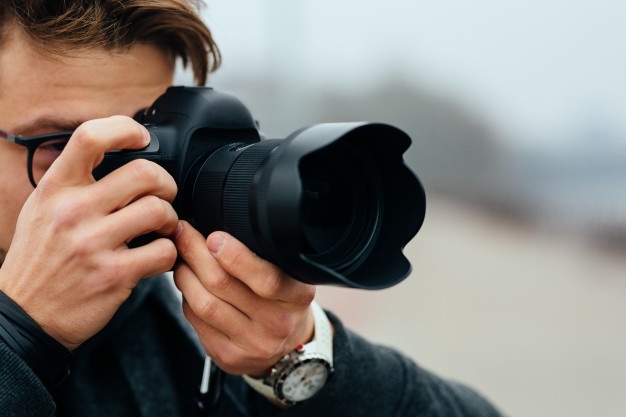 This is a good way to get more publicity, especially if you work on photographing famous people, influencers, or for prominent brands and companies. Even when you are posting a photograph, remember to give credit where it is due. This includes mentioning the model, the person or people in charge of the outfit, the hair and makeup, and every important person who played a role in the shoot. While this may seem unnecessary, it is a way to remain more professional and to ensure that you do not offend anyone by ignoring their contribution to the photograph. In all fairness, a photograph is usually the combined effort of more than just the photographer and their assistants, Understanding this early on and giving credit where it’s due can greatly improve how you are viewed in the fashion photography industry.